1.Connect the Pen to Power Supply ➨2.The LCD Screen will show PLA(Default setting).if your filament is ABS,please click and change to ABS Model ➨3.By press the forward button to start heating,when heat up finished.the light will change from red to green➨ 4.Pressing the Load button(on the side of the pen,the down arrow)by one hand,meanwhile Insert the Filament by another hand. ➨5.Start painting when the Filament com out. 【Kindly Note】:For guarantee your pen's using life,please kindly note 1.DO NOT Touch the heater nozzle when 3D pen is working.2.Pull out the Filament when the Filament's Length is short than the pen, 3.Pull out the Filament when you finished painting.in case there may have any blocking hassle. 1.Please feel free to contact us if you have any questions or problems,we will at your service and answer you within 24 hours. 【Easy to Use & Safe 】1.Connect the Pen to Power Supply ➨2.The LCD Screen will show PLA(Default setting).if your filament is ABS,please click and change to ABS Model ➨3.By press the forward button to start heating,when heat up finished.the light will change from red to green➨ 4.Pressing the Load button(on the side of the pen,the down arrow)by one hand,meanwhile Insert the Filament by another hand. ➨5.Start painting when the Filament com out. 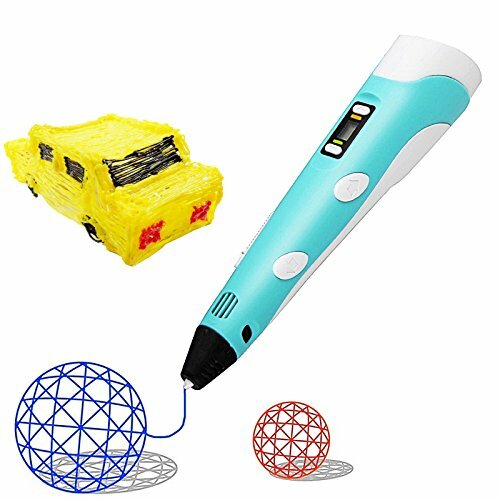 【Kindly Note】 For guarantee your pen's using life,please kindly note 1.DO NOT Touch the heater nozzle when 3D pen is working.2.Pull out the Filament when the Filament's Length is short than the pen, 3.Pull out the Filament when you finished painting.in case there may have any blocking hassle. If you have any questions about this product by Gurmoir, contact us by completing and submitting the form below. If you are looking for a specif part number, please include it with your message.